I’ve realized something: I only see romantic dramas when I’m in a terrible mood. I go into these movies hoping to snark at the implausibility of the on-screen relationships and the filmmaker’s attempt to make me care about these characters with their unique style. Sometimes it works; other times it doesn’t. It was impossible for me to not love Blue Valentine while One Day never stood a chance. In comparison, Like Crazy, the winner of the Best Drama prize at this year’s Sundance Film Festival, faired relatively well. Probably because all the accents were authentic. Jacob and Anna’s relationship suddenly becomes the worst kind: long-distance and not by choice. Jacob and Anna try their best to deal with this development as best they can. There are plenty of missed phone calls, lingering texts, and teary goodbyes at airports. Jacob visits when he can but he still just feels like a visitor in Anna’s life in London. There is something very earnest about Like Crazy, perhaps because it is based on director Drake Doremus’ relationship with his ex-wife. The movie taps into something that does happen – the inability to move on – with many first relationships. It does so with an intimate style of camerawork that allows the audience to feel every glance and bit of emotion experienced by these characters. Felicity Jones won a special grand jury prize at Sundance for her performance, which presents an interesting problem. Part of the reason I didn’t overwhelmingly love Like Crazy or particularly care for this couple’s problems was because of Anna. Not Jones’ performance, but the character she plays. Anna is initially responsible for her relationships problems. Anna also comes off as more needy and dependent on the relationship than Jacob, who we see bury his emotions and try to move on with his life. Because of this, some people, including myself, found Anna to be a character who is both sympathetic and annoying. This also brings me back to my original thought about romantic dramas. The charisma and appeal of the lead actors defines these types movie. If you’re going to invest time in these fictional relationships, you have to care about the characters and somewhat like the actors. You can’t imagine Blue Valentine, which is somewhat akin to Like Crazy in terms of style and story, without Ryan Gosling or Michelle Williams. But Anne Hathaway and Jim Sturgess are equally replaceable in One Day. There is more passion in Felicity Jones’ performance than Anton Yelchin’s but they balance each other out perfectly. 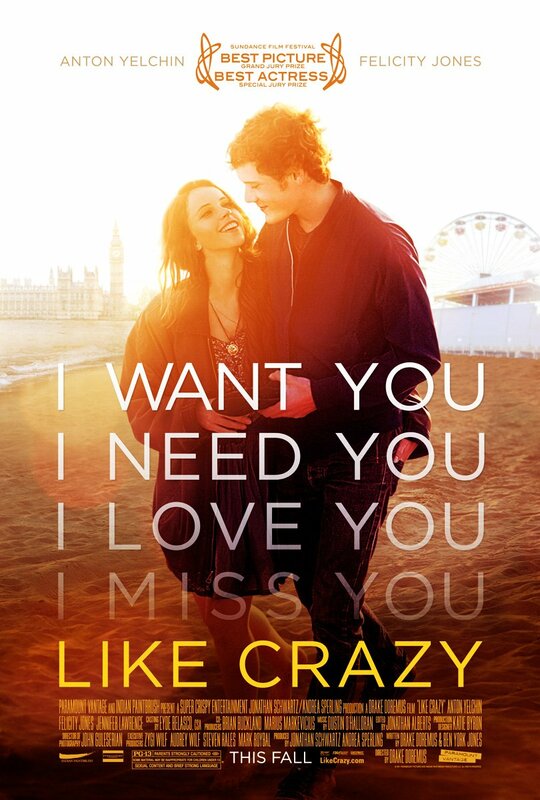 Like Crazy is a touching romantic drama with some good performances.The emotions are real and affecting. But something was missing. Maybe because I couldn’t find myself caring about a couple that caused their own problems by ignoring the law for romance. Or maybe because I connected too much with this relationship and introspection can be off-putting. Next Next post: Skins Rewind: Want To Hear About The Best Day Of My Life?